$0.00 14 days Trial when you purchase full version you won't lose any of your trial settings! Enterprise class modules for connectivity and security. Provider allows access DNN resources using Salesforce user credentials. 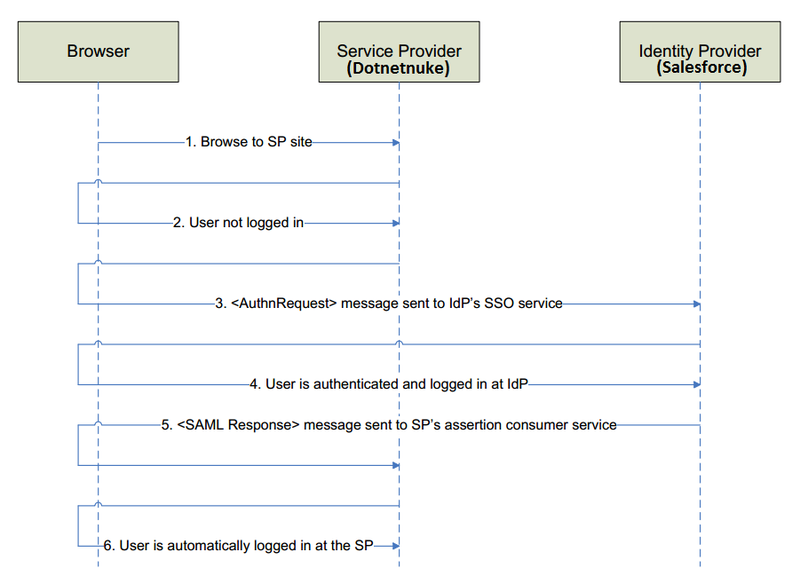 Communication between DNN and Salesforce is set up at the top of the SAML (Security Assertion Markup Language) protocol. User is redirected to Salesforce login page to enter credentials, therefore Salesforce credentials never leaves Salesforce company - SPI (Service Provider Initiated). Single Sign On that allows access Salesforce and DNN (and possible other resources) without having to log in separately to each of it. This can be a great help to your users, because instead of having to remember many username/passwords, they will only have to remember one. Time Savings - on average, a user takes five to 20 seconds to log in to an online application; longer if they mistype their username or password and are prompted to reenter them. With Single Sign On in place, the need to manually log in to Salesforce is avoided. These saved seconds add up to increased productivity. Reduced Administrative Costs - users only need to memorize a single password to access DNN website, Salesforce website and other resources. With fewer passwords to manage, system administrators receive fewer requests to reset forgotten passwords. User who leave the company automatically lose access to company data after their departure. In just a one click, you can block access to Salesforce website and all connected with Salesforce resources, in this case DNN website. We license our modules by DNN instance. When you install a module, you can move your DNN site around when upgrading or migrating - and everything will continue working. We don't restrict you to a particular server. That means you don't require additional licenses for Production, Staging or Development environments - provided they are a copy of the original DNN installation. All our modules have an option to trial the module for 14 days without restriction. After testing the module out, purchase a full license from the store, register your module to retrieve a license key, update the module and carry on. You won't lose any of your changes or configuration settings.